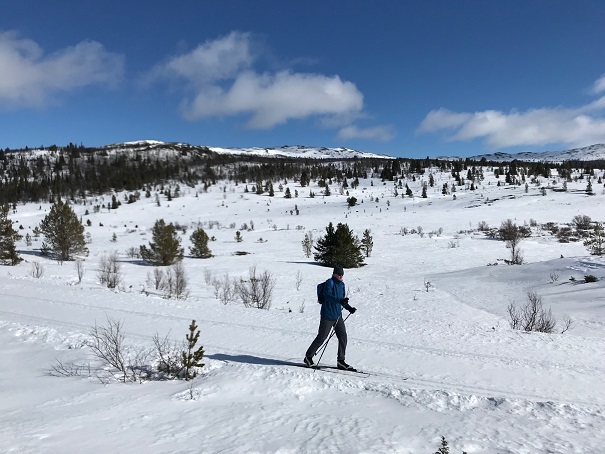 A blog on a superb holiday in Norway, where I learned all about cross country skiing while crossing the Peer Gynt Loipe. Before I start with my tale on the recent holiday I enjoyed, I want to explain why I write this blog (and the next) in English. This is especially for the Warren family (på Norsk: Wårren familie) so they can read along too. In Norway, we met this sportive family, which includes the brothers Ed (Æd) and Paul (Pøyl), their sister Barty (Bårti) , and Betsy (Bætsi), Æd’s wife. They made the same trip as we did, so we met every night at the dining table, and in the morning at breakfast. During the day, we didn’t see them at all; we were feeling alone in the Norwegian vast and beautiful snowy landscape. At first, we were a bit hesitant in getting acquainted with this family, why should we bother? The-man-about-who-I-do-not-write and I were on a kind of honeymoon because recently, our marriage lasted for 25 years (!). We weren’t waiting for some American go-getters. By the way, the-man-about-who-I-do-not-write is called Pøyl in this blog. It’ll be clear soon why I make this one-off exception. Als je liever in het Nederlands leest, kun je hier klikken om naar de Nederlandse versie te gaan, die ik maakte in de app Polarsteps (ik heb geen aandelen). 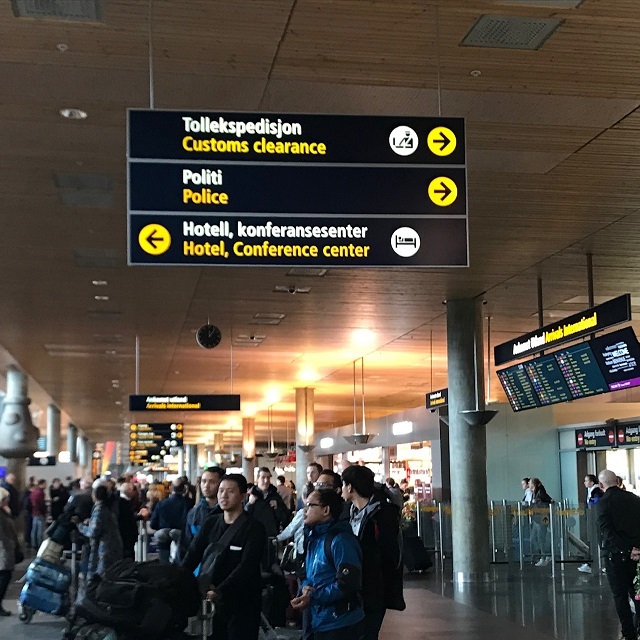 We had a sweaty start on the early Saturday morning of our departure: we were allowed to participate in Schiphol’s new ‘passenger experience center’. This meant we had to walk for miles and miles to reach the new ‘passenger experience center’. When we finally arrived, we were snappishly addressed by a sharp-toned security lady at the security and baggage check. If this is the new idea of ​​‘passenger experience’, then it surely is intended to increase the already present shame-to-fly (in Dutch: vliegschaamte) to Alpine heights. It makes you think: ‘Why on earth do I have to fly, and endure this passenger experience? Although the name is great, at least in English it is, the experience itself is not impressive. It meant mostly we had to walk for endless miles through Schiphol Airport, meanwhile yearning for our first cup of morning coffee. At the experience, we had to undergo the so called ‘Efteling-waiting-experience’, which means that you shuffle back and forth behind a mass of other tourists in a waiting room converted into a proboscis. The total waiting time was indicated on a television screen: 15 – 20 minutes. Halfway, we were relieved to see that the waiting time had increased to 20 – 25 minutes, so Poil and I enjoyed a nice five minutes of time saving. Hurray! After the passenger experience center we went in a line again: now for an extra strong cappuccino at Starbucks. The reason why there’s always a waiting line at Starbucks is a total mystery to me. I suspect it is part of their customer experience, all Starbucks employees must work so slowly that there is always a waiting line left over. Being a person in desperate need of coffee, you get the impression that the coffee that is served must be very, very, very special. The coffee is very, very, very expensive. After coffee, the boarding started, which you do on a plane. You also board on a boat. You simply get on a car or train. ‘Boarding’, that sounds a lot more vacation-like than simply ‘get-on’. I think the passenger experience of flying is partly due to the difference in language use, despite all vliegschaamte. 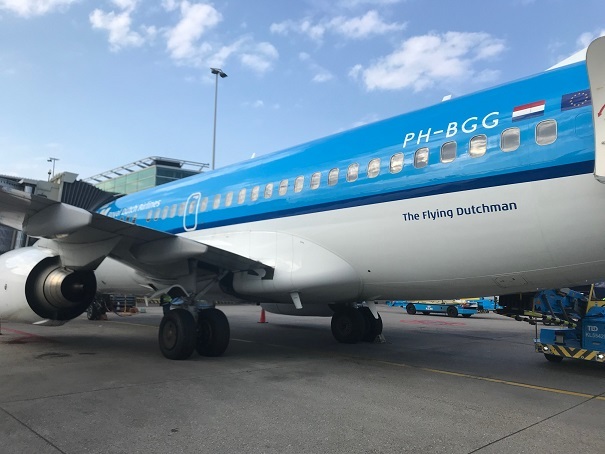 Fortunately we ended up in a KLM B737 (without Max) with the fine name The Flying Dutchman. Via the ‘bagasjehall’ and ‘dørene slår mot deg’ to the ‘tollekspedisjon’. Via the ‘baggage hall’ and ‘the doors touch you’ to ‘customs’. De best tingene i livet er ikke ting. De beste dingen in het leven zijn geen dingen. After eleven hours of traveling by bus, train, plane, train and a taxi van, we arrived at the first hotel. It all went very smoothly. We were tired of sitting the whole day, and because of the long walk at Schiphol Airport to be part of their passenger experience center. Tomorrow, it’ll be an hour earlier, then daylight in Norway lasts until 9 PM. 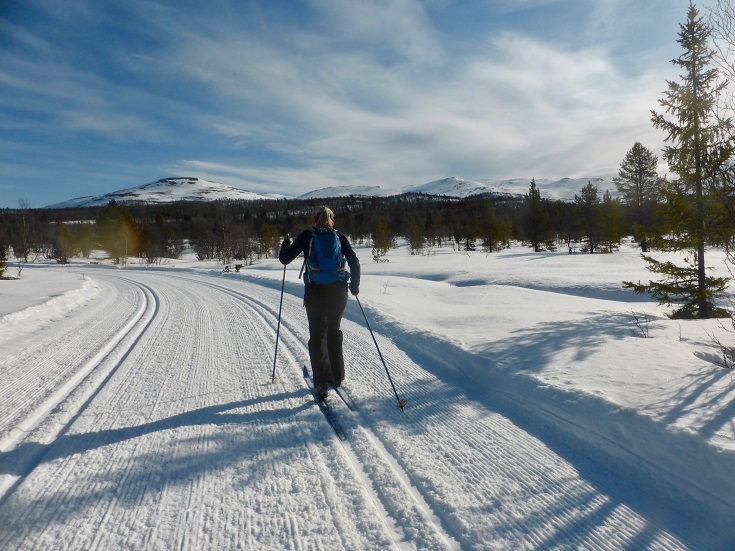 We practiced cross country skiing for about twelve kilometers on the Peer Gyntvegen, as the trail is called here. I’ve equalled this number in falling down. Mostly because of a total out-of-control when descending, which is super difficult on the thin and flimsy skis you use when cross country skiiing. Cross country skiing is just like skating, moving your body mass from left to right and in the meantime push the poles and your other leg. And, just like cycling, it is as if you climb three times more than you descend. Descending is fine if it goes slowly and controlable, but as soon as the terrain is steeper, it’s too fast, and out-of-control. The only workable stopping method I know is falling down. Meanwhile, the weather was nice and sunny, with a temperature around zero Celsius, with good snow conditions. Sometimes, the snow was icy and had a hard surface, which reduced your grip to zero when descending. Or we didn’t go into the pizza enough, that’s possible too. 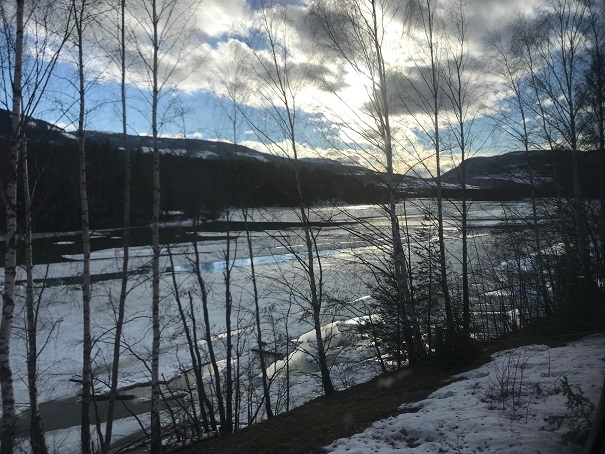 Today, the first trip from Espedalen to Fefor is on our agenda. 18 kms løypen over the Peer Gynt Løype with Pøyl. It’s only now that I found out how to write it correctly here in the Kongerike Norge (the Kingdom of Norway). You write løype. So I write Pøyl, since it’s almost a palindrome. Todays weather was mostly cloudy with regularly a watery sun breaking through the clouds. It felt warmer than yesterday, mainly because there was less wind. 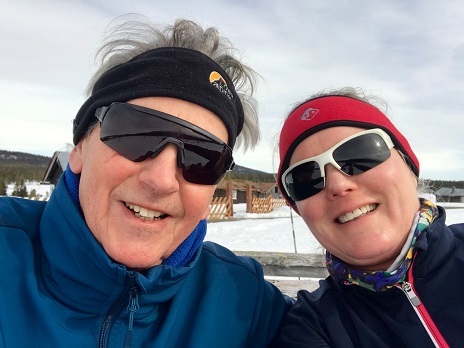 The cross country skiing went well up to 16 km, then all my coordinating skills left me, and subsequently, I fell a lot. At three o’clock we were at the Fefor Høytfjellshotell. We’ve been on the groomed path for about five hours. A høytfjellhotell, high mountain hotel, was most likely built with a governmental grant at the time of the Winter Olympics in Lillehammer. These hotels are huge and were open for just a handful of customers. It looks a bit like a vacation camp in Eastern Europe during the period of the Iran Curtain. I suggested to Pøyl it must have been specially designed for the Olympic Games. No, yesterday, we still had to start. Today we took off, and tomorrow we will continue.